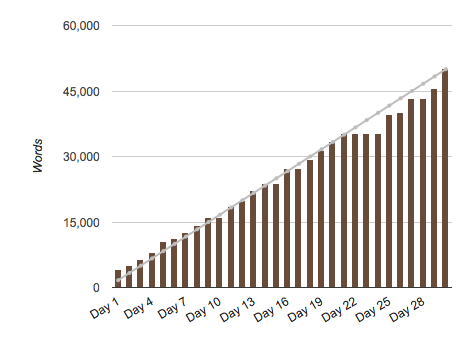 Geek To Author: NaNoWriMo - GOAL REACHED!!! Holy crap, holy crap, holy crap. I did it. I DID IT. I finished my goal and got 50,069 words completed in 30 days. If you have been following this blog at all you know what an accomplishment that it has been. Job, family, major holiday, expecting wife with our second child which is any day now. On top of all of that I was able to get the time in to create. I broke through all the crap of fear, uncertainty and doubt of writing and blasted through it and I did it. Now being that it's my first novel attempt I know it's not the best I could do but I did it and that's more than others that just talk about doing it. (I used to be a talker) Now I can say I am a writer. What a relief. What an experience. What an eye opening exercise to see what I am capable of, how my mind works and how my story evolved and went in directions I never imagined as I was planning the story. There were times in the last 15 days that I let my mind flow, break free of the rut of a plot line that i detailed out and allow my world I had created to control me. New characters were born, new scenarios were created, new ideas were spawned to explore. It's beyond amazing. I get it now. I understand. I know that for the past few years in my prior attempts it was my own mind that was holding me back to allow my full mind to run wild. Once you hit that point you will understand what I mean. On my first attempt I completed the NaNoWriMo challenge. With all the obstacles in my personal life to work around it, I was able to get it done. Time to get back to reading and writing my other short stories I abandoned to focus on this. If any of you are thinking about doing it, I say do it without hesitation. You will be amazed what you are capable of.